The Forte di Bard is in the Aosta Valley, an Italian region in the northwest, near Piedmont. The fort was built in the 19th century by the House of Savoy on a mountain above the town. In January 2006 it has been opened to visitors and now it hosts art and photography exhibitions. 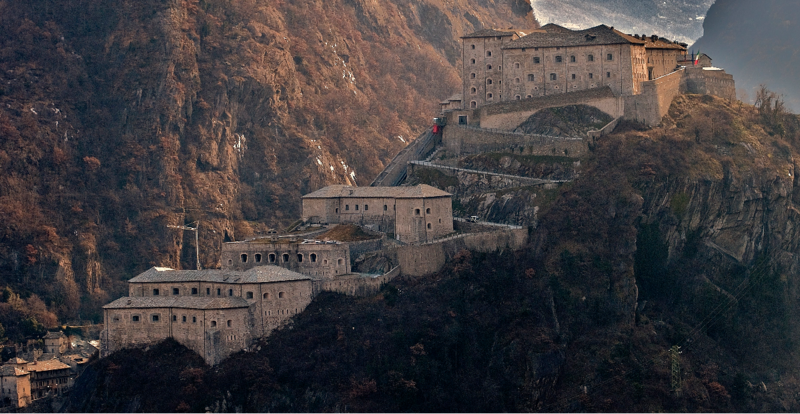 In the Fort there are three permanent itineraries: the Museum of the Alps, The Children Alps and The Prisons. In March 2014 the Fort has been the set of some parts of the film “ The Avengers: Age of Ultron”. Every summer in the internal courtyard there are musical and theatrical performaces. There are also sports events such as the “Monterosa Walser Ultra Trail” and the “Forteight”. Fort Bard has a lot of offers for schools, there are a lot of workshops and educational activities for children of all ages. In the Fort there are a coffee bar, a restaurant, a hotel, some multimedial conference halls and bookshops. Forte: it has two meanings, one is the adjective “strong” (a strong person= una persona forte) and the other is the noun “fort” which means a fortified place (Fort Bard = il forte di Bard).